I first read this book in elementary school. 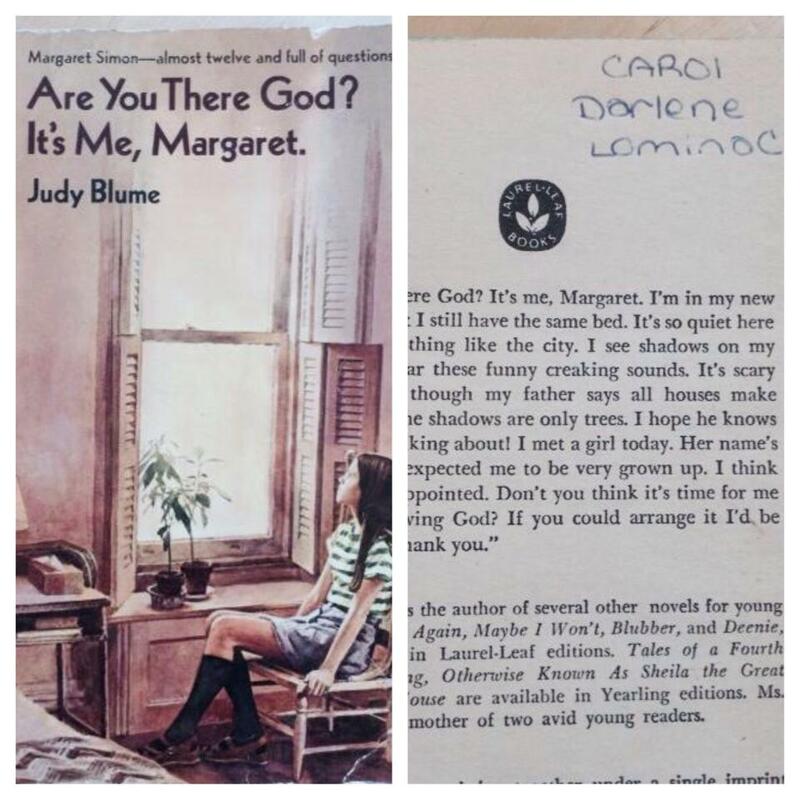 Judy Blume books were all the rage. The above photo is my copy that I have had all these years. I recently re-read this and I have to say, I loved it just as much as I ever did as a pre-adolescent, anxious, self-conscious 6th grader in the early eighties. Different parts of it stand out to me now than did before and my adult perspective changes everything but I am still as impressed as I was then with the way that Judy Blume understands and remembers what it is like to be 12 or 13 years old. She is a brilliant writer and her stories are the epitome of honest. Margaret is confused about a number of things. She is waiting, patiently but watchfully, to begin to “grow” the way that girls eventually do. She and a few girlfriends have a club called the PTS’s. (The Pre-Teen Sensations). This reminded me of a club I was in with my friend I talked about here. Our club was the PPTT. Private Place To Talk. We met in a little fenced in area in her back yard. I don’t remember specifically but I bet we came up with the name for our club after having read about Margaret’s club. The rules for being in Margaret’s club are that they must bring a notebook with a list of boys to talk about, they must wear a bra and they must end their meetings with their mantra/exercise, “We must, we must, we must increase our bust!” There are embarrassing moments shopping for a bra, first crushes and waiting for the day she will finally start her period. These all seem cute and comical to the adult reader, but the pre-teen trying to find her way in her ever changing world and longing to fit in feels the weight of these concerns and so many more. Margaret struggled with trying to find out which “Religion” she wanted to be. Her parents, one Jewish and one Christian, decided to forego pursuing a life of faith in order to keep the peace in their home and with their parents. But no matter how much her parents made their lives NOT about religion, Margaret was desperate to find her own answers and peace with it all. She prayed daily to God, pouring out her heart, questions and requests to Him. She visits a Jewish Temple, and a couple of other churches in hopes of “feeling” God’s presence but only finds herself bored with the sermons and distracted by counting parishioner’s hats and such. She finds herself angry at God when things are not going her way and thankful to Him when her prayers have been answered. She’s just like the rest of us who long to know Him and be known by Him. Can you guess what that prayer was about?? Well, there are a couple of reasons I can see why this book is relevant to LOST. When we see the book on film, Sawyer is reading it on the beach. Anyway, Sun is there to ask Sawyer, the island’s hoarder drugstore, for a pregnancy test. She apparently missed her period. And there’s plenty of talk about periods in the book. Also, faith and religion are explored and discussed often on LOST. Mostly the value of having a faith-filled belief system. Not necessarily an endorsement for any one religion over another. So let me know readers, do you remember this one? 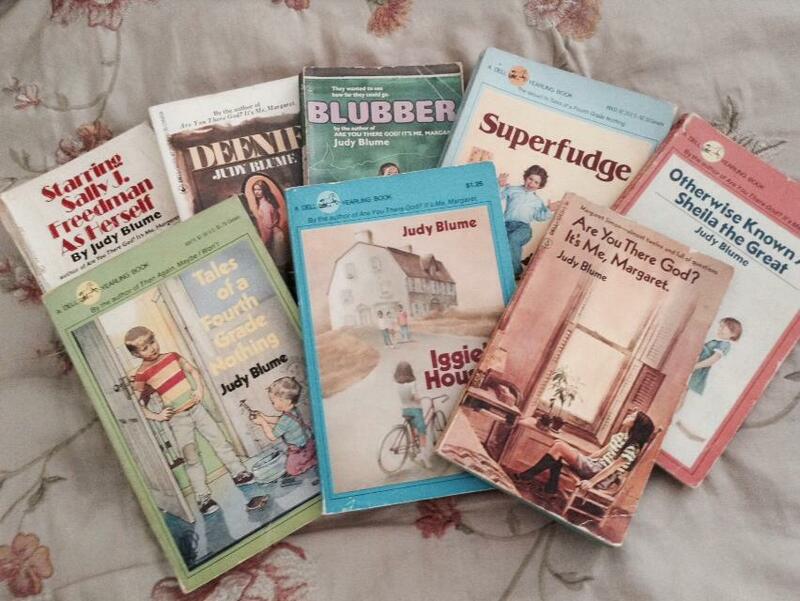 Do you have memories of reading any other Judy Blume books? She was considered controversial but really, she just told it like it was with beautiful sincerity. I leave you with the rest of my childhood collection. Love Judy Bloom. This book helped me know all the awkward girl stuff I was (or wasn’t) dealing with was totally normal. Sorry, I spent my evening planting flowers. CLEARLY I meant Blume, not Bloom. Freudian typo? One day I’m going to learn to plant flowers…..one day…. Oh, I loved Judy Blume as a young girl! I checked it out of the library over and over. I loved that book! And it looks like you and I had a similar collection growing up. Ah, memories. And speaking of memories, thanks for the walk down memory lane with Sawyer. I’d forgotten he read that book. He’s awesome. You’re welcome. I’m happy to inspire memories of Judy Blume AND/OR Sawyer. I loved Judy Blume too as a kid. I had a particular affinity for her ‘Tale of a Fourth Grade Nothing’ and the rest of the ‘Fudge’ series. I think that ‘Fudge-a-mania’ may have been my first ever desperate wait for a book release date. I was seven or eight. Deenie was my favorite! Well, Deenie when I was a little older, Blubber when I was younger. I read a couple more that I don’t have. And even though I have it, I don’t think I ever finished Starring Sally J. Freedman as herself. Judy Blume was one of my favorites growing up. I loved all of her books (esp. Deenie and Blubber) and she talked about issues that we all were going through but afraid to talk about. My girls haven’t read any of her books yet and I wonder if she’ll have the same impact on them.